On Sunday, Kilter wrote a post about being blue and what he does to get out of his funk. He does what I do. Well, I like to add booze to the the mix, but to each his own. When we are bummed out, we turn to music. I'm guessing you do the same, since you are spending your time reading a music blog instead of working/getting off couch/exercising. True to the music nerd he is, Kilter cranks up the Blues to lose his blues. Following that, Film Bird posted a concert review of the funky Warren Haynes Band. These posts reminded me of a bluesy-fun-soul outfit that go by the name of Black Joe Lewis & The Honeybears; a blues band for OUR generation. While working at a pawn shop in Austin, Joe Lewis first picked up the guitar. For the next few years, he performed around Austin at open mic nights and various weekly gigs with his blues trio. The Honeybears formed after Zach Ernst, a member of the University of Texas Music and Entertainment Committee, booked Lewis to open for Little Richard at the University of Texas' annual festival Forty Acres Fest. 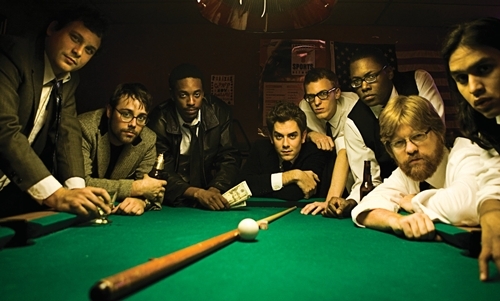 After gaining local acclaim, the band toured as openers for Spoon and Okkervil River in 2007. The rest, as they say, is history. The band describes their latest album Scandalous as "All killer, no filler, the fittingly titled, take-no-prisoners". I'd say it's an accurate description. The album—like the the two albums before it, was produced by Jim Eno, moonlighting from his main gig as Spoon’s drummer. It's a tasty stew of Rock, Blues and Funk, well seasoned with a dusting of Punk. Listening to BJL & The Honeybears is like hearing James Brown or Howlin' Wolf, The Meters, or even, on occasion, Sam Cooke for the very first time. Much like the artists he's influenced by, Lewis writes from his often gritty experiences. The songs of Scandalous speak about bad relationships, money troubles, and the difficult and sometimes so-crazy-it's-funny road of life. You've been there, and it feels good to relive these blues, if only to release them. Makes me kinda regret never taking the trip for myself, if not for the stories I might have to share! The song "I'm Gonna Leave You" is an electrifying blues song about getting out of a bad relationship, before it gets out of control. It's a close call, as it always is in those situations. There is no shortage of blues and funk bands, and then everyone else is stealing the best of the genres for their own alt/punk/folk/indie hybrids, but Joe Lewis is the real deal. A Blues and Funk sound that's fresh and new, and made for you.